This letter is long overdue, but after spending nearly three years in and out of hospitals, wound clinics, and doctors' offices, we have been enjoying our freedom from worrying about the aftermath of our car crash in August 2014. We are happy to have our lives back and look forward to enjoying our retirement. At our initial meeting in your Fairfax office, you gave us a couple of coffee mugs with a cartoon of Ben as a cape-wearing superhero. We laughed about the mugs when we got back to the car, but now I can honestly say that you two came through as superheroes for us. Throughout our long ordeal (nine surgeries, long periods of healing, severe stress), you not only provided outstanding legal counsel but also showed genuine concern for our well-being. 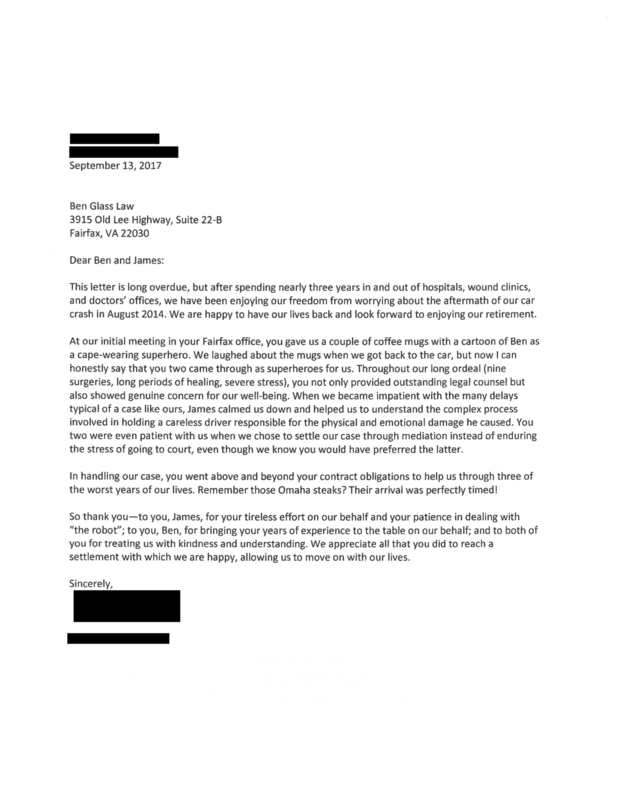 When we became impatient with the many delays typical of a case like ours, James calmed us down and helped us to understand the complex process involved in holding a careless driver responsible for the physical and emotional damage he caused. You two were even patient with us when we chose to settle our case through mediation instead of enduring the stress of going to court, even though we know you would have preferred the latter. In handling our case, you went above and beyond your contract obligations to help us through three of the worst years of our lives. Remember those Omaha steaks? Their arrival was perfectly timed! So thank you-to you, James, for your tireless effort on our behalf and your patience in dealing with "the robot"; to you, Ben, for bringing your years of experience to the table on our behalf; and to both of you for treating us with kindness and understanding. We appreciate all that you did to reach a settlement with which we are happy, allowing us to move on with our lives.